There are many different types of nails. The grading system can be confusing and the many different types of coating and head styles to go with them just add to the confusion. This list is by no means exhaustive and will be updated from time to time. Nails are graded on size. The sizes are graded in a system that refers to their size. The unit is called a "penny." The larger the number, the larger the nail. A 3-penny (3d) nail is much smaller than a 16-penny nail. Note: The penny sizes were once used as the price per hundred of nails, but now we use this as a measure of length (approximate, at least). We abbreviate the "penny" with the symbol "d". Actually the "d" is alleged to be derived from the "denaruis", an early Roman coin. 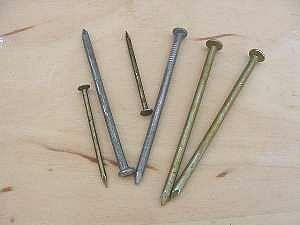 The four types of nails that you will usually run into are: finish, common, roofing and drywall. Common nails have larger heads that are clearly visible after the nail has been driven. They are used for framing buildings and situations where appearance is not important. Finish nails have a much smaller head that can be concealed after the nail has been driven. These nails are used for applying trim and other areas where appearance is important. 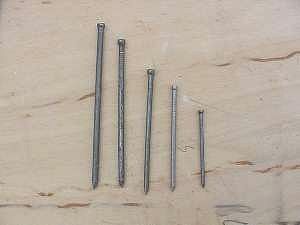 Roofing nails have a large head that are intended to hold shingles and are usually galvanized. 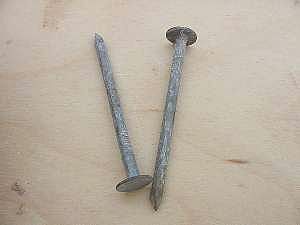 Drywall nails look the same as roofing nails but are not galvanized. Galvanized: these nails are available in common, finish and roofing and are recommended for exterior applications as they resist rust. Adhesive Coated: These nails usually have a dark coating that is intended to make them stay where they are driven. Spiral: The body of a spiral nail is twisted like a screw. These nails are excellent for exterior applications that are subjected to repeated stress. Decks are a great example Some of these nails are coated with adhesive. 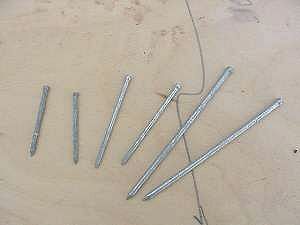 Masonry: These nails are "hardened" and will endure the stress of being driven into a mortar joint. Cut: These nails have a square body and head. They are used in masonry and are also found in older homes. Aluminum: These nails are used for plaster lathe and other specialty applications.